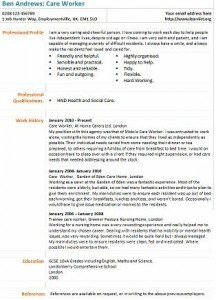 Care Worker CV example and template. Amend as suitable and use it for your job applications. Care Worker job vacancies can be found on the job sites online including reed, totaljobs, jobsite and cv-library.co.uk. All you need to do is to visit them and start searching for the positions that are near you are you are prepared to relocate for. You can also send your CV to Care houses for their considerations. Care Worker interview advice, salary and pay rates and cover letter examples to be added later on. A job description will also be added so you can think about getting into this career. I am a very caring and cheerful person. I love coming to work each day to help people live independent lives, despite old age or illness. I am very calm and patient, and I am capable of managing a variety of difficult residents. I always have a smile, and always make the residents feel loved and cared for. HND Health and Social Care. My position with this agency was that of Mobile Care Worker. I was entrusted to work alone, visiting the homes of my clients to ensure that they lived as independently as possible. Their individual needs varied from some needing their dinner or tea prepared, to others requiring a full day of care from breakfast to bed time. I would on occasion have to sleep over with a client if they required night supervision, or had care needs that needed addressing around the clock. Working as a carer at the Garden of Eden was a fantastic experience. Most of the residents were elderly, but able, so we had many fantastic activities and trips to plan to give them enrichment. My main duties were to ensure each resident was up out of bed each morning, got their breakfasts, lunches and teas, and weren’t bored. Occasionally I would have to give issue medication or monies to the residents. Working for a nursing home was a very rewarding experience and really helped me to understand my chosen career. Dealing with residents that ha mobility or mental health issues, was very rewarding. Sometimes it would be quite hard but I always managed. My main duties were to ensure residents were clean, fed and medicated. Where possible I would entertain them. Click here to download Care Worker CV Example in Word, Doc format and start working on it. These CV templates are the copyright of Learnist.org, 2012. Jobseekers may use these CV examples for their own personal use to help them create their own CVs. You are most welcome to link to https://www.learnist.org/care-worker-cv-example/. However they may not be distributed or made available on other websites without our permission. If you have any question then contact us!